It’s worth pointing out that the WordPress website migration tool we’ll be using in this guide is a premium plugin. While there are free tools out there, if you value your time, want to eliminate the risk (as much as possible) of something going wrong, or you just want to get the job done as effortlessly as possible, it’s definitely worth considering going pro with a paid plugin. However, don’t make a decision just yet. Instead, check out this guide to see if this really is the best option for your project. Whether you’re moving to a new web host, want to create a copy of your entire site or just its database for testing and development, or you need to clone or migrate your WordPress website for some other reason, here’s our guide to using WP Migrate DB Pro to complete the job as conveniently as possible. As mentioned, WP Migrate DB Pro is a premium WordPress plugin. There is a free version available. However, as this guide will demonstrate, the premium features are what make this plugin so good. In addition to the core premium WP Migrate DB Pro plugin — which has been designed for effortlessly pushing and pulling the database between two WordPress websites — there are also some optional add-ons available. These add-ons will be demonstrated in this guide to migrating a WordPress website. However, to quickly give you an idea of what they can do, they’ve been created to help you easily transfer WordPress themes, plugins, and media library files, between two sites. There’s also an add-on for carrying out WordPress multisite migrations and another for using WP CLI to perform migrations on the command line, rather than through the WordPress user interface. Psst! we have an exclusive WP Migrate DB Pro coupon to get 20% off. Is it Worth Going Premium? If you’ve tried manually migrating a WordPress website and its database then you’ll probably be familiar with some of the problems that can occur. File upload limits, import timeouts, and confusing error codes can all make what should be a straightforward process time consuming and stressful. There’s also the added risk of losing your website data along the way. For example, if you have ever exported a database file to be imported to the new server and performed a manual find and replace on the SQL file to swap out the URL to the new URL, you might have been bitten by the data corruption that can occur from array data stored as a serialized string. What a hassle! 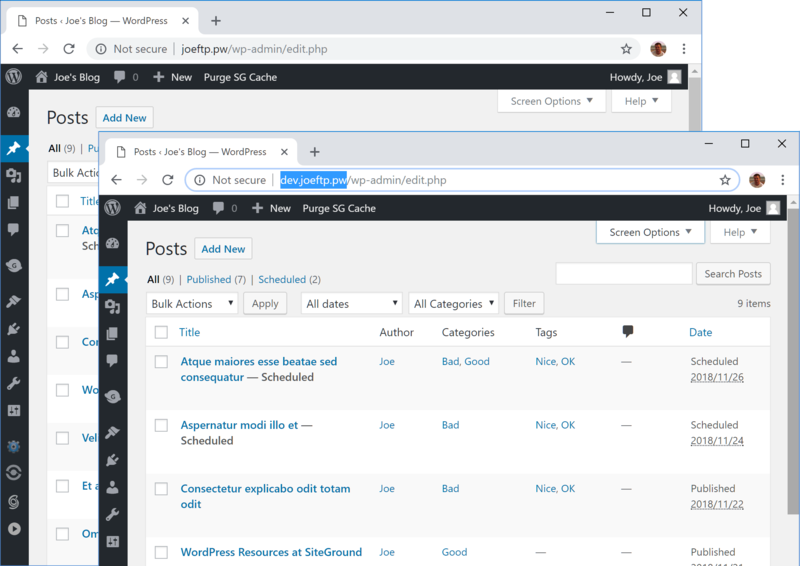 Instead, with WP Migrate DB Pro, you can securely connect two WordPress websites, and then push and pull the database and other components between the two sites at the touch of a button – with all the find and replacing taken care of. With WP Migrate DB Pro, there’s no need to use phpMyAdmin or another interface to access and migrate the WordPress database or upload files via FTP. Instead, everything takes place through the familiar WordPress Dashboard. So although you do have the option of taking a more hands-on approach to transferring a WordPress website and its database, or try your luck with a free plugin, if you want to save time and minimize the risk of something going wrong, opting for a premium tool like WP Migrate DB Pro is a good investment. If you’re still not sure if it’s worth upgrading to a premium tool, this guide will now show you how to migrate a WordPress website from one location to another with WP Migrate DB Pro. Now that you’re familiar with WP Migrate DB Pro, it’s time to see how easy this plugin makes migrating WordPress databases and other content between two sites. Step one of the migration process is to install and activate the WP Migrate DB Pro plugin on both WordPress websites. As the plugin is only available from the WP Migrate DB Pro website, you’ll have to download the files from there, and then upload them to your WordPress websites. Once the plugin is up and running on both websites, it’s time to connect the two sites. Thankfully WP Migrate DB Pro makes this very straightforward. On the WordPress website that you want to copy from, navigate to the Migrate DB Pro section of your WordPress Dashboard. With the Migrate tab selected (which it should be by default) click on the Push option. The text field below the Push option will ask for the connection info, which is the site URL and secret key. This information is available from the WordPress website you wish to copy — or push — the site contents to. So log into the WordPress Dashboard of the destination site, and then navigate to the Migrate DB Pro section. This time, click on the Settings tab. From here you can find the connection info and the secret key which you need to copy and paste into the WordPress website you want to copy from. On this page, you also need to change the permissions so that the plugin can accept the data from the source website and overwrite the existing data to carry out the migration. Once you’ve copied the connection info and turned on the Push permission, you can switch back to the other WordPress website that you’ll be migrating the content from. You can now paste the connection info that contains the site URL and secret key into the text field under the Push option. Then press the connect button. If all goes according to plan, the two sites should be connected. In the next section, you’ll see the find and replace rows. This section allows you to change any references to the source site’s URL to the destination site’s URL. This ensures that all the internal links work once the site content has been transferred to the new URL. However, there’s no need to enter these details manually. Once the two sites are connected, WP Migrate DB Pro populates these fields automatically. This saves you time and effort while also reducing the chances of something going wrong with this aspect of the migration. However, you can also add your own custom find and replace commands if necessary. Next up, the plugin gives you the opportunity to select which database tables to migrate. By default, the entire database is selected, but you do have the ability to deselect any tables that aren’t needed. In the next section, you can choose which if any post types to exclude from the migration. Again, by default, everything is selected. But you can easily choose not to migrate the post revisions, for example. The advanced options give you more control over the migration, such as whether or not to exclude spam comments from the migration or transfer the active plugin settings. You also have the ability to back up the remote website database before the plugin overwrites it as part of the migration – this is always a good idea so be sure to check this option. Depending on your objective and which WP Migrate DB Pro license you purchase, you might also want to transfer the WordPress themes and plugins from your source website as well as the files from the WordPress Media Library, including any images you’ve used in your posts and elsewhere on your website. If you do want to do this and you have access to the appropriate add-ons, you can simply check the relevant boxes. As you can see, WP Migrate DB Pro gives you full control over which themes and plugins to transfer to the destination WordPress website. Finally, you can choose which files, if any, to exclude from the migration, before saving your migration profile for reuse. Now for the moment of truth! Hit the Push & Save button to start the process. Once the migration has started, the progress will be displayed on the screen. A message will be displayed once the database and other components have been pushed to the destination site. Now you can log into the destination site and check to see if all the posts and other content and settings have been migrated. If you also migrated the plugins and themes, the two sites should now look identical. Hopefully, the ease and speed of the migration process have impressed you and you can see why WP Migrate DB Pro and its add-ons really are the most straightforward way to transfer a WordPress website from one location to another. Once you’ve connected two WordPress websites and created a clone of one of the sites, you could carry out development work or testing on the copy. Once you’re happy with your work and satisfied that everything is working as it should, you can use the plugin to quickly migrate the clone site to the live site. As mentioned, WP Migrate DB Pro isn’t a free plugin. While there is a free version, it’s lacking the best features of WP Migrate DB Pro: the ability to connect two websites and almost instantly migrate the database and other content between the sites at the touch of a button. Instead, the free plugin simplifies the process of exporting your WordPress website database but leaves it to you to import that file into the destination site database yourself – not always an easy task! There are also other migration plugins you can use, as well as transferring the database and other files manually. However, as we’ve just seen, the premium WP Migrate DB Pro plugin makes light work of copying a WordPress database from one site to another, along with the option of cloning the themes, plugins, and files from the Media Library at the same time. So if you’re looking for a foolproof way to migrate WordPress websites, whether you’re changing web hosts, moving a site from development mode to a live environment, or testing out the latest version of WordPress or your choice of plugins, WP Migrate DB Pro comes highly recommended. Like what you hear? Get 20% off WP Migrate DB Pro. Is this the best WordPress database and website migration plugin for your project? Please let us know in the comments below.